Can you believe it? Applying “Digital Rights Management” (DRM) to lock-down coffee pods? Why, you may ask? To prevent you from using K-Cups from competitors! And to think that I was primarily concerned with DRM on purely “digital” products (i.e., ebooks, software, movies, etc.). 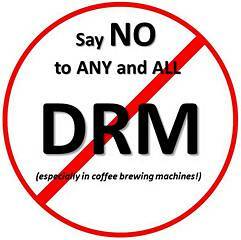 Remember… DRM, in any form, only RESTRICTS your rights or use of a product. You can read the entire lawsuit here (beware… it’s 141 pages in length & approx 2MB). Gee… like having 85+% of the coffee-pod market isn’t enough? Green Mountain has to have more??? That’s precisely what is wrong with much of corporate America today, be it Comcast, AT&T, Monsanto, etc., basically most any monopoly. They NEVER seem to have enough, and strive to obtain even more & more… at the expense of? — yeah, us — their pathetic consumers. 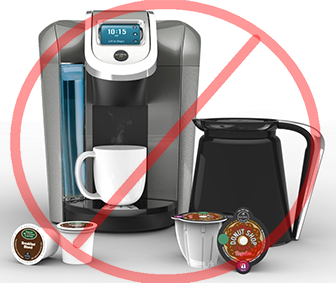 Anywho’s… am I concerned or upset about Keurig’s announced DRM plans? Not really, as I’m not that interested in single-serve brewers. If — and I say “if” — I were to consider a single cup coffee brewer, I’d choose only the BUNN MCU Single Cup Multi-Use Home Coffee Brewer. For about the same price as a Keurig, you get a multi-use brewer that handles K-Cups, pods, coffee grounds, tea bags (or leaves), soup, etc, and IMO is constructed much better than any Keurig on the market. I bought one for my 90-yr-old resident mother-in-law nearly a year ago & she loves it, using it daily for coffee; tea & soup at lunch; and tea in the evening. As for me, I’ve been grinding my own beans now for over 15 years and it’s getting harder to accept pre-ground or any “pod-like” coffee. IMHO, even the cheapest 2.5 lb bag of coffee beans from Costco’s or Sam’s Club tastes orders of magnitude better than any pre-ground or K-Cup brew, and you can’t beat the price advantage — less than 10 cents/cup vs. 45-70 cents/cup via K-Cup coffee. Even when I’m splurging on gourmet beans, my price/cup seldom exceeds 25 cents. How do you DRM a thing like a coffee pod? So… enjoy your cuppa Joe! No matter how your brew it! You are currently browsing the archives for the DRM category.